Would you like to participate in the BTCA Health Certification Program? It is open to BTCA Members ONLY. Welcome, the AKC Canine Health Foundation was set up in the mid 1990's in answer to Time Magazine's article "A Terrible Beauty" in which they talked about the increasing genetic disease inherent in purebred dogs. Our BTCA Health Committee was formed in 1999 in response to the conversations that we had serious problems in our breed that were not getting much attention. The Mission of the Health Committee shall be to assist Boston Terrier Breeders in improving the health of the purebred Boston Terrier breeding stock by helping bring their dog's natural qualities to perfection, and in so doing advance and protect the interests of the Breed. The Committee shall also provide education on health matters to all Boston Terrier owners and shall keep abreast of new developments in the field of canine veterinary medicine and canine genetics affecting our Breed. It shall also be the mission of the Health Committee to assist in fund raising for BTCA Board approved projects to improve the health of our Breed. CAUTION! The material presented here is for educational purposes only. 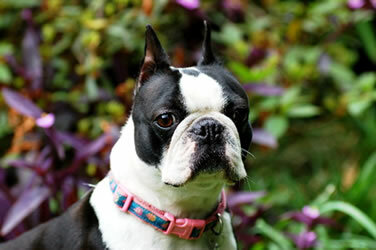 A diagnosis cannot be made without a veterinarian's examination of your dog. The Health Committee and BTCA do not vouch for the accuracy of any of the information presented here. Please consult your Veterinarian with any questions you may have.